Netflix And The Satanic Temple Reach Amicable Agreement Regarding Sabrina – Zero Equals Two! “But it seems there’s now no bad blood between the two, as Greaves announced on Wednesday that his lawsuit against Netflix and Warner Bros has been ‘amicably settled’. But it seems there’s now no bad blood between the two, as Greaves announced on Wednesday that his lawsuit against Netflix and Warner Bros has been ‘amicably settled’. 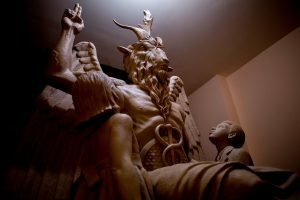 “Both the show and the Satanic Temple’s statues display Baphomet sitting down as two children look up at him. Greaves said Netflix also agreed to acknowledge the ‘unique elements of the Satanic Temple’s Baphomet statue’ in the credits of the Sabrina episodes that have already been filmed. Read the whole story here: https://dailym.ai/2QcCeTK. Rule of thumb: anyone who labels themselves a “satanist” actually isn’t— they’re just cringe.